Harvest time at Grace Vineyards. Wine in China is getting a lot of attention just now. Jancis Robinson is back from Beijing and Shanghai, where she celebrated the release of a Chinese edition of her indispensable Oxford Companion to Wine with wine dinners and tastings. Recent issues of Decanter (April 2010) and the Wall Street Journal (March 20, 2010) feature big stories about Chinese wine. One of my senior thesis students is even doing research on the potential market for Washington State wine in China. I’ve written about China’s wine market on several occasions. I discussed the challenges facing their industry in “The China Syndrome” in January 2008 and the difficulties of penetrating the Chinese market in October 2009. I even reported a London wine merchant’s forecast that China would eventually overtake France as the world’s greatest wine nation. Challenges and opportunities: those seem to be the recurring themes. The challenge is easy to appreciate if you taste Chinese wine. At present this is difficult (unless you travel to China) because import supplies are very limited. The Morrisons supermarket chain apparently carries some Chinese wine in Great Britain. So far I haven’t seen Chinese wine for sale in the U.S., but I think it’s here somewhere so I’ll keep looking. There is obviously a large potential ethnic market (at Asian food stores like Uwajimaya and at the tens of thousands of Chinese restaurants that dot the country) in addition to curious wine enthusiasts like me. I have tasted two Chinese wines, thanks to a former student who schlepped them back from Beijing for me. The first, tasted with a group of students a year ago, showed the murky past of Chinese wine. It was a 1999 Changyu Cabernet Sauvignon — a recent release mass market product by China’s oldest winemaker. Tasting notes I found on the internet warned about coffee grounds and ashtray with a hint of urinal cake. Right on the money, unfortunately. Drinkable (hard to believe, I know), and weirdly fascinating, but really only interesting as a novelty. The basic problems, as I have pointed out in the past, are the undemanding domestic consumer base and the badly broken supply chain. Wine is only as good as the grapes that go into it, or so growers tell me, and the grape supply situation in China is difficult. Most of the wine grapes are grown by families that lease about an acre of land from their local agricultural commune. That acre is typically divided into four or five small plots that are planted with different crops so as to minimize risk. One or perhaps two of the plots may be wine grapes in the vineyard regions. So vineyard scale is impossibly small — smaller even than in the south of France. These small growers insist on calling the shots, which is natural since they are so dependent upon the success of their tiny farms. 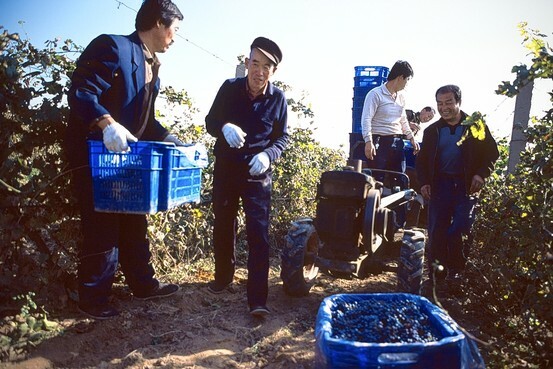 The wine producers have no control over what these hundreds of thousands of micro-vineyards produce, how they are cropped, and when the grapes are picked. Researchers suggest that the grapes are chosen and grown to maximize quantity not quality and that the grapes are picked as soon as possible to minimize risk of poor weather than could destroy the crop. So small crops of flavorful fully ripe grapes — the winemaker’s dream — that’s not going to happen in a typical Chinese vineyard. One study I found suggested that the grapes sell for as little as $80 a ton. There is not much incentive for individual growers to sacrifice quantity for quality because their grapes are sold by weight to agents who lump together fruit from dozens or hundreds of individual growers. Good fruit would quickly get mixed with inferior fruit, so why pay more? The local agents often then resell the fruit to regional agents who sell again to the large winemakers. You can just imagine the condition of the fruit by the time it finally gets to the winemaking facility having passed through so many hands. This system is worse than the European cooperatives I have read about (and I didn’t think anything could be worse than that). Recently a group of us tasted the hopeful future of Chinese fine wine, a bottle of 2003 Grace Vineyards Tasya’s Reserve Cabernet Franc. Grace Vineyards is often cited as the most promising winemaker in China and the contrast between this bottle and the Changyu was night and day. The attention to detail in the winemaking was evident and the use of estate grapes (rather than the unreliable supply chain cited above) was apparent, too. The contrast between the two wines was stunning, mainly because the Changyu was so very bad, of course. The Grace Vineyards Cab Franc was a solid effort but nothing special– a bit light compared to our Washington State Cab Franc wines, for example, with the distinctive “green” taste I associate with wine made from under-ripe Cab Franc grapes. This points to another challenge and one that will be hard to overcome. China is a pretty difficult place to grow and properly ripen vinifera grapes. The combination of very cold winters and hot and humid summers in the principal grape growing regions makes winegrowing particularly tricky. (The Decanter article does a good job explaining this.) Some reports indicate that white varietals like Riesling can be grown with success, but wine’s first duty in China is to be red and ripening the preferred Bordeaux varietals is a significant long term problem. The Wall Street Journal article by Stan Sesser included tasting notes by a panel of local experts. The nonvintage Changyu Cabernet Sauvignon they sampled sold for the equivalent of $5.40 and reminded them of dirty sweat socks and cleaning fluid — possibly a step up from the one I tasted. At the other extreme, a 1998 Cab from Great Wall was apparently really quite good — “deep colored, full bodied, tannic, but with a lot of fruit.” Price? The equivalent of $72. Yikes! I have to think that Chinese wine will benefit in the long run from all the attention it is receiving at home and abroad. It will be interesting to see how the challenges and opportunities develop over the next few years. Note: Anyone interested in the Chinese wine market should read Grape Wall of China, a terrific blog. Wine in China is indeed an interesting phenomenon fueled by fast, or perhaps meteoric economic growth in the past couple of decades or less. Being kind of an old guy myself, I remember the same thing happened when other nations were capitalizing on the leading capitalist nation in the world. When Japan was king, they came to America and bought up many of our national treasures (icons like Columbia Corp – now Sony, and the Empire State Building, etc) and generally spent money like drunken sailors. They came and went (and still have not recovered economically) and then came the oil money from the Middle East. Pretty much the same thing. I remember in the early ‘80s asking a wine merchant why I could no longer find a nice red Burgundy anymore and he calmly explained to me that the Japanese had bought many of Burgundy’s very small vineyards in the region and that it was difficult to get Burgundy into US wine shops because much of the low output was being shipped to Japan. What could a young man do but move on to California Pinot Noir, which was really not even a close comparison at that time? Now China, and it’s really not surprising. Sadly they are absolutely raiding our cellars in America (because we are letting them), to the point that if things keep going this way in the next decade, only a handful of Americans will be able to afford to buy Classified Bordeaux and Grand cru Burgundy. The latest auction results reveal that ’82 Château Lafite-Rothschild is selling for about $4000 a bottle again, near its all time high in 2007. Château Petrus is selling at even higher prices and all of this is due to our nouveau riche Chinese friends. And trust me, when all the Lafite and Petrus are drained from this country, we’ll beg to be friends with them. Right now the Chinese are on track to acquire western goods of luxury and wine is certainly considered part of that. As I have mentioned before, it wasn’t that long ago that the Chinese were mixing Lafite with Coke and ice, simply because they didn’t know any better, but are now becoming more acclimated to western cultural influence and at least serving it properly. As far as China growing world-class grapes, it really is doubtful. First and foremost is the problem of climate as the mentioned in the post, secondly it takes many, many years to figure out what grows best where, and at least for now if it doesn’t have the European or the western image of greatness, no one in China will care about Chinese wine. Oh, and one other interesting fact: many Asians have a gene that makes them allergic to alcohol. This alone will limit their growth in any kind of domestic wine market. Chinese wine buyers today are only interested in having bragging rights attached to their collection. Maybe being allergic to alcohol helps account for some of their amazing productivity? I know I’d probably get more done if I didn’t’ think about wine all the time.